In Minecraft, smelting is similar to crafting but requires a furnace rather than a crafting table. Smelting is the process of breaking down your ore from mining into ingots, which can be used to craft more advanced items like minecarts or armor. For example, if you are collecting iron ore through mining, you can then smelt down those ores into iron ingots. Those iron ingots can be used to craft a set of iron armor and weapons, which can help you protect yourself from hostile mobs or enemy players. Learning how to smelt in Minecraft is easy. All you need for smelting is access to a furnace, ore blocks (or in some cases, wooden blocks), and a fuel source. To smelt ore in your furnace, you must leverage a fuel source. Early in the game, the most common fuel sources are wooden planks, previously crafted wooden tools, or weapons that have been replaced with stone items. The other major source of fuel is coal, which is easily mined, or charcoal. Iron ore is one of the most often used ingredients in crafting quality weapons, tools, buckets, flint, steel, and shears. As a block of ore, it can be easily mined compared to other rare ores like diamonds. However, simply mining iron does not leave a player with the proper crafting ingredients to build most items in the game. After collecting the ore, the iron must be smelted into an ingot before it can be used for crafting items. Collect iron ore through mining (or other resource collection methods). Place the iron ore in the top of the furnace grid, or above the three flames on the left side of your furnace grid. Place a fuel source in the bottom slot (charcoal is the most commonly used fuel source). Move your newly crafted iron ingots to your inventory! Gold ore can be mined with an iron or diamond pickaxe (just hold the pickaxe and then hold down the mouse button to start mining). Gold ore is then smelted into individual gold ingots, exactly similar to the process listed for iron ingots. However, when it comes to gold ingots, these items can be broken down even further into gold nuggets. Ingots are necessary to make golden apples, powered rails, and clocks. To smelt gold, place gold ore in the top of the furnace and fuel (like charcoal) in bottom to yield one gold ingot. Charcoal is similar to coal but is smelted from wood, making it easy to create on your first night playing the game. This allows you to create a torch, which is a useful tool for surviving the nighttime. Though slightly time-consuming, smelting charcoal from any wooden items yields a more efficient fuel than burning wood directly. 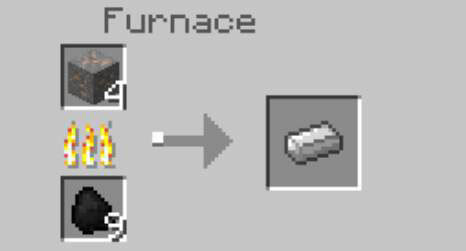 To smelt wood into charcoal in Minecraft, place any wood in the top of the furnace and any fuel in the bottom (commonly, another wood source).